It’s about that time again. 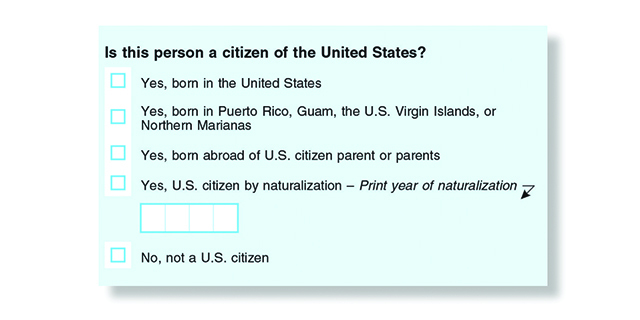 Every ten years, the Constitution requires the U.S. Census Bureau to administer a set of questions to every person living in the United States. The Constitution calls for an “actual enumeration,” and does not allow any government entity to fill in numbers when individuals fail to respond, while still requiring that everyone living in the US be counted. Based on those answers, the federal government distributes over $800 billion a year to programs that millions of Americans use every day, and final counts of the 2020 Census will determine the amount of federal funding dedicated to key programs young adults benefit from for the next ten years. An inaccurate enumeration from the 2020 Census could result in young people losing access to programs that make education and health care more affordable and accessible by impacting state and federal budgetary decisions. In March of this year, the Department of Commerce, working closely with the Justice Department, chose to officially add a question regarding citizenship status to the 2020 Census. The new question asks respondents to identify their immigration status, and it provides no alternative response options for legal non-citizens or an opportunity to decline to answer. Minorities, immigrants, and people who live in poverty are already less likely to respond to the census. This was true before the Bureau added the controversial citizenship question. In this volatile political climate, with the administration’s combative posture towards immigrants and other minority groups, many communities who were already reluctant to offer personal information are all the more unlikely to want to offer any information at all. At the same time, these communities are often the ones that depend the most on an accurate count, with the programs helping them succeed at stake if they go uncounted. If the active threats of a new untested, fear-mongering citizenship question are not enough to worry you, the fact that young people in particular are at risk of going uncounted due to simple confusion should. Not only are young people historically more likely to move around, but many young people may not know whether our parents counted us in their households or if we count ourselves if we’re away at college or if we live alone. Only 37 percent of Millennials own homes, and the unpredictability of our lives makes it much more difficult to answer affirmatively to the questions provided. And there are fears that the most indebted generation in history will choose to sit out because they are in default or behind on student loans and are afraid that the census will mean targeting or retribution. So, should our parents count us on their forms when we’re away, or do we fill out our own? Where do we really count? And how does this interact with the other parts of our lives? Each census dictates funding for programs for ten years, and for young people a lot can happen in ten years. It coincides with a time of significant growth and transition in our lives, and those few questions we get in the mail will have dramatic impacts on young people. The next ten years for Millennials means starting families, buying homes, and driving the U.S. labor force and economy. Generation Z will enter and graduate from college, begin repaying student loans, and start their first jobs. While young people are working to get make their adult lives financially secure, they need to be able to rely on support programs that could be at stake. The census directly impacts funding for 132 programs that provide health care access, higher education assistance, and infrastructure around the country. These programs include $71 billion in SNAP, $17 billion in TANF, $30 billion in Pell Grants, and over $11 billion in CHIP. One of the most significant programs that an undercount could impact is Medicaid. Specifically the census will determine the percentage of a state’s Medicaid costs that are paid for by the federal government. From 2009-2017, the U.S. population of 18-34 year olds grew by only six percent while Medicaid enrollees grew by 76 percent in that age group, indicating Medicaid expansion after the Affordable Care Act captured new at-need populations. Today, Medicaid enrolls 13 million young adults (18-34), which accounts for 18 percent of all young adults. Medicaid is an important example of the interconnectedness of the census and most major social assistance programs. The Medicaid funding formula also calculates funding levels for CHIP, adoption assistance programs, child care programs, and more. The interactive chart above demonstrates what just a one percent undercount could mean in terms of funding losses by state. For example, a one percent undercount in Vermont could result in the loss of over $14 million for programs funded by this formula, which would translate into losses of $2,309 per person missed in the census. There could be grave consequences from a slippery slope sparked by an undercount: when states begin losing out on millions of dollars the federal government provides, they start cutting from elsewhere to make up the difference. Where do they cut from? Increasingly, we see that the funds typically come from programs that young people benefit from including higher education, and wrap around services. The unpredictability of our next ten years is made even more uncertain when we are worried what valued programs state governments could cut to make up the difference created by an undercount. Our generation cannot afford to lose the programs that help to support our path to financial security. Education debt disproportionately cripples our generation, our home ownership hit a 30 year low this year, and we increasingly have trouble keeping up with medical costs. Filling out the census is something we can do right now to give ourselves a chance at funding solutions and appropriately allocating resources. So, if you have questions about whether your parents are putting you on their forms, ask. If you’re concerned about what your answers will mean, speak up. And if you’re worried the citizenship question as written will impact a fair and accurate count, you can tell Wilbur Ross and the Department of Commerce that the census is supposed to help you, not hurt you between now and August 7th. Haaleh Katouzian was a 2018 Policy and Government Affairs Fellow at Young Invincibles. She is a graduate of the University of Texas and a rising 2L at the George Washington University Law School. She is a native of Houston, TX and a huge fan of the Houston Astros.